The main events of World Youth Day are the same as they have been for years, but Pope Francis “is full of surprises,” said Jesuit Father Federico Lombardi. Briefing journalists July 17 about what to expect in Brazil, Father Lombardi had a thick red-bound tome of Mass texts and other prayers, the pope’s official schedule as released May 7 and a more detailed schedule complete with little icons of airplanes, cars, helicopters, popemobiles and a liturgically vested walking pope. The icons provide a quick visual clue as to how the pope will move. For example, the little car illustrates his arrival July 25 at the Varginha sector of the Manguinhos complex of slums. He’ll begin in the neighborhood church (there’s an icon for that), then walk along the neighborhood streets. He is likely to encounter a family and visit their home. Then he will continue walking to the soccer field, where he will address the entire community. Plans for a papal trip to Rio de Janeiro were begun under Pope Benedict XVI. The dates of Pope Francis’ trip are the same, Father Lombardi said, but he has scrapped one day of rest and added several events: a visit to the Shrine of Our Lady of Aparecida; a visit to a hospital that serves the poor and those recovering from addiction; the visit to the slums; and a meeting with the coordinating committee of the Latin American bishops’ council, CELAM. Father Lombardi said Pope Francis probably will add a speech to an already planned lunch meeting July 27 with the cardinals of Brazil and bishops from Rio and the surrounding region. One thing the pope will not be doing, he said, is giving a news conference during his 12-hour flight to Rio July 22, although he does plan to personally greet each of the 71 media representatives on board. No matter who is traveling, choosing what to take on a trip is a detail that must be dealt with. The pope’s biggest pieces of luggage have four wheels and an engine: the popemobile. 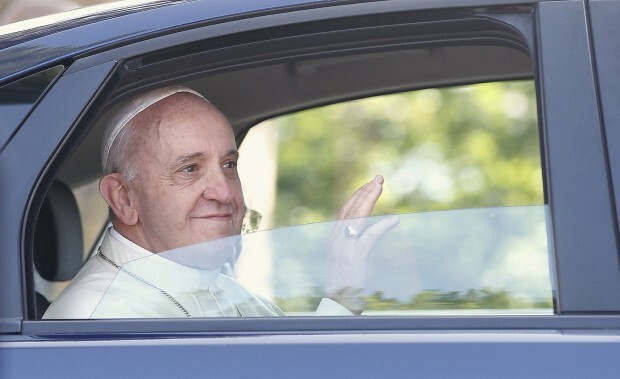 Usually Vatican officials or Vatican security take care of choosing the papal transport, but Father Lombardi said Pope Francis insisted that he will not ride through the crowds in Rio, isolated in a bullet-proof, bubble-top set of wheels. The amount of money spent on papal trips is always a question but has garnered even more attention this time since it is the first foreign trip of Pope Francis, who embraces simplicity and encourages others to do likewise. The Brazilian newspaper Folha estimated July 16 that the cost of World Youth Day in Rio would be between $142 million and $155 million. On another simplicity-related question, Father Lombardi denied media reports that Pope Francis had asked Alitalia — the airline flying him to Rio — not to reconfigure the plane for him and, specifically, not to install a bed for him. It has been years since an airline installed a bed for a pope, he said, because most first-class seats on long-haul flights fold down almost flat. Pope Francis isn’t the only one making changes here and there. 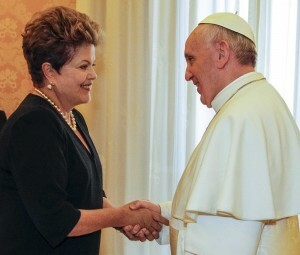 Brazilian President Dilma Rousseff has invited all of the presidents of Latin American countries to join their pilgrims in Rio. Father Lombardi said he did not know how many have accepted the invitation, but if some show up, it would likely be for the July 28 closing Mass. Newspapers already are talking about as many as 3 million people attending the liturgy.